Evidence Tape is pressure-sensitive tape seals envelopes, cartons, bags, and other packages or containers holding evidence. Aggressive acrylic adhesive sticks to most surfaces. 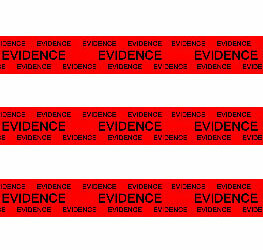 Polypropylene preprinted evidence tape - red (2 mil) is pressure-sensitive tape seals envelopes, cartons, bags, and other packages or containers holding evidence. Aggressive acrylic adhesive sticks to most surfaces. Create a tamper-evident seal by writing case information across the tape and package.